The Valerie Fund wants to help our young people realize their dreams, and as more children survive, more have the opportunity to continue their education after high school. By increasing the funds available for scholarships, we can make sure additional students are able to attend college or vocational school and improve their lives and futures. Adults who were patients as children can bring extraordinary compassion and insight to the fields of medicine and psychosocial services. With additional funding, we will increase support for students who choose to pursue related careers, and who, as professionals, will be there to care for the next generation of Valerie Fund kids and their families, and help look for better treatments and cures. Through its network of Centers at leading area hospitals, The Valerie Fund clinicians treat a large patient population. We now wish to harness the power of this network to gather and analyze learnings about how psychosocial services impact health and quality of life of patients and their families. Not only does this provide an opportunity to learn from our patients, it also provides an opportunity to contribute to the field that will ultimately benefit patients inside and beyond The Valerie Fund network. 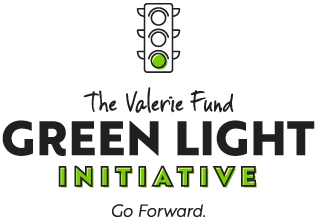 GIVE THE GREEN LIGHT TO PATIENTS TO KEEP THEM ON THE ROAD TO SUCCESS.